Carcharodontosaurus (Latin for shark toothed lizard) was a large theropod lizard that lived in Africa during the Cretaceous (Late Aptian to Early Cemonian), 100-93 million years ago. Even though Carcharodontosaurus is not well known, it was the second largest theropod dinosaur. It was larger than Tyrannosaurus, but was smaller than Spinosaurus. 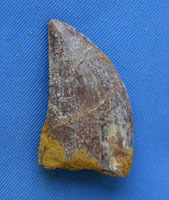 Carcharodontosaurus' skull was lightweight, porous, and had large fenestrae (openings or windows). It was a powerful hunter and had long arms with hook-like claws for grasping. 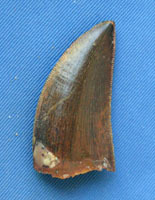 Its jaws were narrow with teeth shaped somewhat like a great white shark. There were ridges above the eyes similar to other Allosauroids. Carcharadontosaurus was about 40 - 43 feet in length, as an adult, and weighed about 5 to 6 tons. Kingdom: Animalia, Phylum: Chordata, Class: Carcharodontosaurial, Order: Allosauridae, Family: Carcharodontosauridae, Genus: Carcharadontosaurus, Species: saharacus.